Alexander Rescue Squad & EMS, Inc. In the vast field of Rescue work, it often takes many different types of equipment to locate, access, stabilize and transport our victims. For many years in the past, victims of the water were sometimes at best difficult to locate. In many instances one of the main reasons that area Rescue Squads were formed was to locate drowned victims. It was a mixture of equipment and some skill but largely luck to find a victim underwater. Drag hooks with ropes attached and grappling poles were about the only means to locate victims. In recent years divers have been a more popular means of victim location; however in our bodies of water it is difficult at best to see much more than two or three feet around you. Diving certification is very expensive and the cost and maintenance of equipment makes this type of victim location not cost effective. Alexander Rescue maintains mutual aid agreements with several agencies in our region that are certified in open and black water dive and recovery. In late August 2010, Alexander Rescue Squad took a major step in modern day technology to locate victims underwater. The Squad purchased and has installed on one of the departments three boats a Hummingbird Side Scanning Imaging (Sonar) Device. The unit (pictured above) is the 1197C Search and Rescue Model. It will provide operators a view of the water column between the surface and the bottom as well as a picture of the bottom of the water body. The unit has the capability of an onboard Global Positioning System (GPS) for marking the location of the victim or other objects of interest. The unit gives information as to the depth, temperature and how fast the boat is traveling. This tool along with the regional diving capability and the current means of underwater search will greatly enhancement the overarching safety aspect, a quicker victim recovery and should reduce overall response cost of underwater search. If you look to the top left (indicated by the arrow) you will see an actual victim image as it appears on the bottom of the body of water. This picture is courtsey of Roseboro Rescue & EMS, Inc in Sampson County, North Carolina.This victim was located and recovered in a matter of a few hours (a process that otherwise may take several hours to a day or more). Squad members will begin training on the use of the device over the course of the next few weeks. The Squad has made contact with the marketing company for Johnson Outdoors (parent company of the Hummingbird brand name) who will be sending a Technical Specialist Representative to train Squad members in its use. The members of Alexander Rescue Squad would like to thank the Citizens of Alexander County and The Town of Taylorsville; along with both governing bodies for your continued support and our Board for allowing us to purchase equipment that greatly enhances our jobs and helps us to bring closure to families who suffer this type of loss. If being forewarned is forearmed,then local residents may want to make use of the county’s latest program. The Alexander County Offices of Emergency Management and Public Health have contracted with Emergency Communications Network to license its CodeRED high-speed notification solution. (Think of it as a space-age phone tree.) The Code RED System provides Alexander Count officials the ability to quickly deliver messages to targeted areas or the entire County. Russell Greene, Alexander County Emergency Services Director, cautioned that such systems are only as good as the telephone number database supporting them. “If your phone numbers are not in the database, you will not be called,” he stated. One of the reasons the CodeRED system was selected is it gives individuals and businesses the ability to add their own phone numbers directly into the system’s database, this is an extremely important feature. “No one should assume his or her phone number is automatically included,” Greene said, urging all individuals and businesses to log onto the official Alexander County website, www.alexandercountync.gov, and follow the link to the“CodeRED Community Notification Enrollment”page. Those without Internet access may call Alexander County Emergency Services at 828-632-9336 Monday through Friday, 8 a.m. - 5 p.m. to supply their information over the phone. Required information includes first and last name, street address (that is the physical address, not a P.O. Box), city, state, Zip Code, and primary phone number. Additional phone numbers can be entered as well. All businesses should register,as well as all individuals who have unlisted phone numbers, who have changed their phone number or address in the past year, and those who use a cellular phone or Voice-Over-IP(VoIP) phone as their primary number. Questions should be directed to the Alexander County Office of Emergency Management, 828-632-9336. The school year is in full swing and parents and kids alike have a daily routine to get to and from school. But whether it’s the first day of school or the last, it’s important for parents, students and motorists to exercise caution in their daily commutes. Erie Insurance offers the following tips to keep you and your family safe. Pay extra attention to your speed. 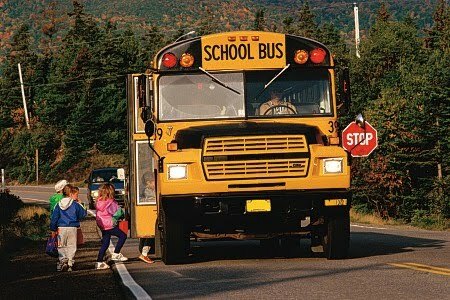 Watch for school zones, and slow down when you see a bus. Pay attention to children who are waiting for a bus. Children may run into the street without looking. Slow down when the bus driver activates the flashing yellow lights. Stop when the bus displays flashing red warning lights and extends the stop signal. Vehicles must not pass until the flashing red lights and all other signals are turned off. Never pass on the right side of the bus, where children enter or exit. This is illegal. Before crossing the street, look left, right, and left again. Young pedestrians can face a variety of tough decision-making situations and dangers while walking to and from school. Walk with a buddy and always try to cross a street when a crossing guard is present. Have a safe place to wait for the bus, away from the street. Always buckle up and require passengers to do the same. Obey the speed limit and posted traffic signs. Avoid distractions such as loud music and cell phones while driving. The Wake Forest University Baptist Medical Center revealed its latest addition to the AirCare fleet on September 3rd for several local emergency services agencies in Alexander County. The recent addition of the EC-130 helicopter to AirCare’s fleet has allowed them to reach out to the communities in their service area and has greatly reduced response times. The ultimate goal of any emergency service agency is better and more expedient patient care. With a 14 minute flight time to the center of Alexander County from the Boonville/Elkin, NC base, the quicker flight time could greatly affect the patients who may be airlifted. These are just a few things that prompted the brief display of the new chopper to several agencies in Alexander County. The EC-130 cabin is wide which allows it to comfortably carry the patient and medical crew. It also uses the patented Eurocopter Fenestron™ shrouded tail rotor, which makes it the quietest helicopter in its class. The EC-130 has a large crew safety focus with the latest terrain awareness/mapping and collision avoidance software available. This aircraft, like the current EC-135, is staffed by a seasoned pilot, and an experienced medical crew consisting of a registered nurse and a paramedic. With the new addition, AirCare’s current fleet consists of 1 EC-135 helicopter, 1 EC-130 helicopter and 2 ambulances. AirCare is part of an EMS network serving patients in North Carolina, South Carolina, Virginia, Tennessee and West Virginia. AirCare provides fast, safe transportation for critically ill or injured patients. 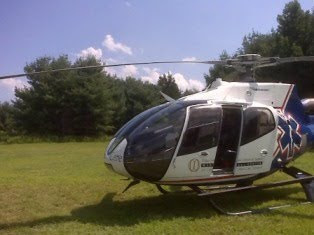 AirCare has provided service to the community since May, 1986 and will be celebrating its 25th Anniversary in 2011. 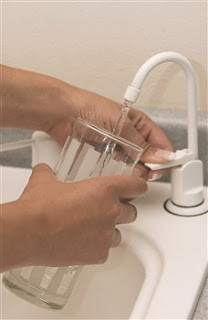 Based on the laboratory analysis of water samples collected from EnergyUnited Water Corporation on August 25, 2010, water users were notified about 4 p.m. today (Aug. 26) that it is no longer necessary to boil water used for human consumption. Rod Watts, of EnergyUnited Water Corporation's Stony Point office, stated that he appreciated the public's cooperation during this period. Previously, the water consumers of Energy United Water Corporation, in Alexander and Iredell Counties experienced periods of low pressure and outages in the distribution system due to major main break in the City of Newton water system that occurred on Aug. 24. Periods of low or no pressure in the distribution system increased the potential for back siphonage and introduction of bacteria into the water system. That situation prompted the Division of Environmental Health to advise that consumers boil all water used for human consumption or use bottled water whether there had been any changes in water pressure or not. According to Town Manager, David Odom, those who pay their water bill to the Town of Taylorsville, had water fit for consumption, though Taylorsville was on a stage II mandatory water conservation. The Town of Taylorsville, as a precaution, had to temporarily terminate the normal water supply from Energy United Water/City of Newton. The town then began operating from reserves within two above-ground storage tanks. The Town purchased bulk water exclusively from Alexander County (supplied by the City of Hickory) until the all clear was given from the normal supplier. Odom said this was accomplished through a piece of infrastructure put in place in the 1980s: an "interconnect" water line that joins the water line on Hwy. 127 with one at Three Forks Church Road. He praised the foresight of those leaders' actions and also the support received from neighboring agencies. "I would like to thank EnergyUnited for their assistance and expertise. I also want to thank Alexander County Government and the City of Hickory for providing a backup source of water. This event shows the importance of water and also, in times of crisis, the importance of working together," Odom related. "Without the 127 interconnect to Three Forks Church Road, this could have been a very stark event." The water consumers of Energy United Water Corporation, in Alexander and Iredell Counties are experiencing periods of low pressure and outages in the distribution system due to major main break in the City of Newton water system that occurred on 8-24-10. Periods of low or no pressure in the distribution system increases the potential for back siphonage and introduction of bacteria into the water system. Therefore, the Division of Environmental Health advises that consumers boil all water used for human consumption (including drinking, cooking, brushing teeth, making ice and washing hands) or use bottled water whether there have been any changes in water pressure or not. Vigorous boiling for one (1) minute should kill any disease-causing organisms that may be present in the water. Energy United Water Corporation is strongly urging the water consumers to conserve water whenever possible. This advisory remains in effect until further written notification is issued. According to Town Manager, David Odom, if you currently pay your water bill to the Town of Taylorsville, your water is fit for consumption, but Taylorsville is now on a stage II mandatory water conservation. The Town of Taylorsville as a precaution has decided to temporarily terminate the normal water supply from Energy United Water/City of Newton. The town is currently operating from reserves within two above ground storage tanks. The town will purchase bulk water exclusively from Alexander County supplied by the City of Hickory until the all clear is given from the normal supplier. Residents should refrain from any non-essential water use for the next 24 to 48 hours. The Town of Taylorsville is not under a water boil notice at this time. Watering of lawns, shrubs, trees, ornamental plants, etc. Washing of outside areas such as driveways, carports, outbuildings, etc. Residential washing of vehicles including RV's and ATV's. Filling of pools of any size or type, including "kiddie" pools. Operation of ornamental pools, ponds, or fountains. Taking water from a hydrant for any reason other than fire protection. Click Here to view the VFIS Brochure on taking the seatbelt pledge!!! ALEXANDER MEMBERS ASSIST IN SEARCH FOR VICTIM — Alexander Rescue Squad and other local agencies assisted in scouring the waters of Lake Hickory June 30 after a drowning was reported. Catawba County officials have confirmed that a young man died due to drowning in Lake Hickory last week. According to Roy Brown, Captain of Detectives for the Catawba County Sheriff’s Office, the victim was identified as Mong Zong Khang, age 27 of Conover. The event was witnessed by several other people nearby. Khang was part of a five person group who were boating on the lake last Wednesday, June 30. Brown said Khang and two others jumped from the boat to swim in an area near the Highway 127 bridge. However, the others had on personal floatation devices, and Khang did not. He was considered a good swimmer by his peers. Witnesses saw Khang go under water but called for help when he did not resurface, according to accounts of the tragedy. With the assistance of Catawba County fire and rescue and surrounding agencies, Khang’s body was located before nightfall. Brown said technology known as side scan sonar was used to locate Khang’s remains. He added that the death is being investigated as an accidental drowning. The Lodge Hall Court (State Road 1483) railroad crossing will be closed on July 13. The Thomas Lane (State Road 1487) railroad crossing will be closed on July 14. Signs alerting motorists of the closure will be posted this week. Both crossings are being closed because they are redundant due to their close proximity to the nearby intersections at N.C. 90 and Ruritan Park Road and were identified for closure as part of an Area Crossing Study. The closings are part of NCDOT’s overall effort to work with communities to reduce the number of redundant, high-accident or low volume rail/highway at-grade crossings throughout the state. LODGE HALL COURT CROSSING: Once closed, the area to the south of the Lodge Hall Court crossing can be accessed from N.C. 90. The north side of the crossing can be accessed from Ruritan Park Road (State Road 1488). The crossings at Shuford Road and Linda Lane/ Fire Lane were improved earlier this year as a part of this corridor project. THOMAS LANE CROSSING: Once closed, the area to the south side of the Thomas Lane crossing can be accessed from NC 90. The north side of the crossing can be accessed from Ruritan Park Road (State Road 1488). The crossings at Shuford Road and Linda Lane/ Fire Lane were improved this year as a part of this corridor project. Since 1993, NCDOT has closed more than 155 public at-grade rail crossings. Copyright 2010 Alexander Rescue Squad & EMS, Inc. All Rights Reserved. Awesome Inc. theme. Powered by Blogger.